Crude prices this morning are $46.43, up slightly this morning from today’s opening price of $46.25. Prices rose gently yesterday, rapidly gaining $.75 but shedding $.50 before closing, to give a gain of roughly $.25 off the morning lows in the high $45’s. Prices are just .06% higher than yesterday’s closing price. Diesel price are $1.5172, rising a more respectable .45% ($.0068) since closing yesterday. 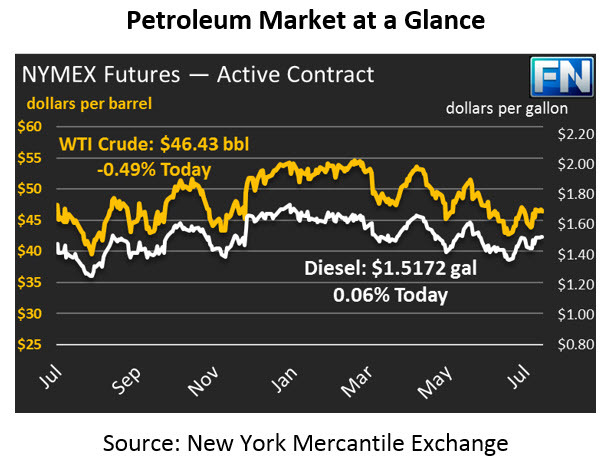 Diesel tracked crude markets higher yesterday, rising $.025 above morning lows before settling lower. Gasoline prices are $1.5943, a sizable $1.54 (nearly 1%) gain from yesterday’s price. Gasoline was buoyed higher both by rising RINs values, increasing refiners’ operating costs, and by a large-than-expected stock draw reported by the API. Unlike crude and diesel prices, gasoline did not give up its large price gains yesterday, gaining over $.03 off its daily low price. Markets have been buoyed higher in recent weeks by declines in the U.S. dollar. Over the past three weeks, the dollar has given up 2.75% of its value amid confusion and uncertainty in Washington D.C. Tomorrow’s article will provide more details on the effects of the dollar on prices. The API released their inventory report yesterday afternoon. The report showed a surprising stock build for crude oil, accompanied by strong draws from gasoline and diesel inventories. Crude inventories have been held back somewhat today due to the surprise crude build, but overall the market is waiting for the official EIA data later this afternoon.